Our home should be a safe heaven a place to relax, kick off our shoes and breathe easy. Take the Quiz over at Real Age to sniff out the culprits and healthy-up your home. We believe the small act of scouring the sink can be a giant act of changing the world. When you use Get Clean you're never simply cleaning. While you make your home cleaner you make your family healthier. 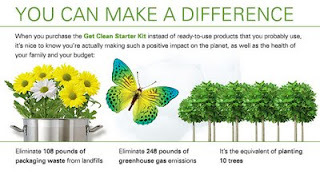 You also make the planet healthier for other families as well. And if you think like we do Get Clean works great and tell others imagine the ripples you can create just by scouring the sink. One of the nice things about using Get Clean is that once you get rid of all those undesirable cleaners you may have in your home, you won’t have to replace them with 27 more. This multi-talented set is all you need to start cleaning your way to a healthier home. With our 100% money back guarantee, you have nothing to lose. Except dirt and a whole lot of toxins.